Looking for something different to do this summer? 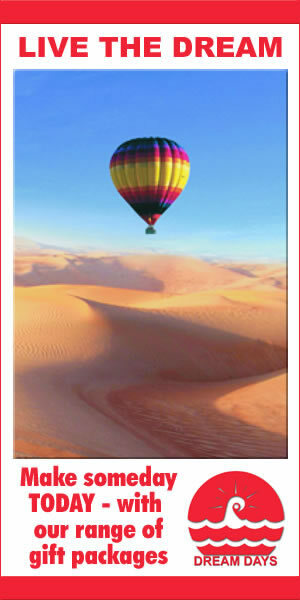 Been to all the sun and sand beach destinations? Seen enough galleries and ruins? Then a cycling vacation could be the answer. Switzerland: While the French Alps are often considered the most popular European destination for mountain bikers, Switzerland’s Valais region is the Continent’s cycling secret. Follow the Rhône River as it cuts through the mountains to the shores of Lake Geneva, enjoying amazing alpine scenery without too many cardiac arrests. Save some energy for tackling the local gastronomy and wines, as you trundle along smooth and uncrowded roads, past vineyards, castles and lowland villages all the way to the slick city of Geneva. In 1998, the tourist authorities opened up nine national long-distance cycle routes that criss-cross the country on 3300km of dedicated signposted paths, mostly well away from traffic. Cycle routes in the cities are also plentiful. Rentals are readily available: it’s a rare train station that doesn’t offer bike rental. There are numerous chains which allow you to return your ride to a different location than the one where you stated. 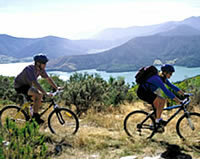 New Zealand is a paradise for most outdoor activities. It promises very little traffic, wide open roads and beautiful, undulating scenery to pedal through, from rugged coast to glacier-clad mountains. The Queen Charlotte Track, only 71km long, follows skyline ridges over the Marlborough Sounds to subtropical forests brimming with native wildlife. Leave your luggage with porters who will deliver it to your next overnight stop, leaving you free to enjoy the beaches and forests all the way from Ships Cove to Anakiwa. 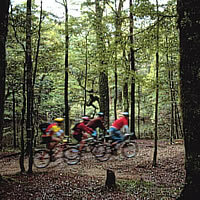 The Queen Charlotte track has been purposely built to cater to both walkers and bikers. It is the longest piece of continuous single track in the country and is suitable for novice riders while being challenging enough for the experienced mountain biker. United States:Of course, everything in America is big and cycling opportunities are no different. If you’re prepared to load up your panniers for the full-on American cycling expedition, pedal a section of the Continental Divide Trail. 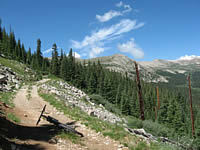 The trail, at 5,000km, is the longest off-pavement bike route in the world, stretching from Canada to Mexico. Alternatively, the Sierra Nevada wraps the magic of the US into a bite-sized parcel of amazing mountain and coastal scenery. The Tahoe Rim Trail is the day trippers’ choice - the winding track includes exhilarating descents through wild, ancient forests, plus views of mountain peaks and hidden beaches around Lake Tahoe. The New Mexico section is particularly stunning; it takes cyclists through the heart of El Malpais National Monument, a fantastic area of lava flows, cinder cones, and lava tubes. The Great Divide Route maps were first published in 1996, and more than 18,000 map sections have been purchased since then. Cuba:Where bikes outnumber cars by 20 to one, travelling by two wheels is really the only polite way of getting around. Follow Fidel’s history from the streets of Havana to the deep forests of the Sierra Maestra – the roads might not be smooth, and don’t expect to keep up with the locals, even if your bike outshines their vintage numbers, but the culture, coastlines and jungle-covered mountains make free-wheeling from tip-to-toe of the island a pleasure. Recuperate from more-rugged rides on the picture-postcard beaches, and reserve some energy to dance to the rhythms of salsa, sounding through the cities of Havana and Santiago de Cuba. Vietnam: It’s very inexpensive to rent a bike and join the race cycling from Ho Chi Minh City to Hanoi, but variable road conditions and kamikaze traffic have taken away the romance of this classic route. Better to pedal in the north, among the mist-tipped highlands where the H’mong, Dao and other minority hill tribes reside. Ride beyond the west side of the Hoang Lien mountain range, past paddy fields, waterfalls and forest thickets, and then from Sapa up into even more remote villages and the cone-shaped peaks of Bac Ha. With thousands of kilometres of stunning beaches and beautiful coastal roads as well as some of the freshest seafood going it can be an indulgent experience. You can plan a route that’s never very far from a beach and stay in comfortable hotels. If you miss the chaos of the big cities, just join in the bustle of the Saturday markets as you pass through. Jordan: Cycle tourism in Jordan is still in its infancy, but those in the know are ditching their camels for a smoother desert ride in the saddle of a bicycle. Pack a sense of adventure and your own repair kit and spend a week free-wheeling the scenic route between the archaeological wonders of Amman and Aqaba. Veer off the highway at Madaba, cycle on past Mount Nebo and you can see the Dead Sea and avoid the steep Wadi Mujib valley. Then, with Petra, the Dana Nature Reserve and Wadi Rum each less than a day’s ride apart, there’s more than enough to keep you entertained all the way to Aqaba. Ethiopia: Morocco has always been considered north Africa’s mecca for mountain bikers, but in recent years Ethiopia has proved a worthy rival with its own winning combination of dusty, adrenalin-inducing trails and back-country village life. Not for the novice cyclist - get on your bike in Addis Ababa and head off towards the Rift Valley, where locals – still surprised to see mountain-biking visitors – welcome you into their rich and colourful culture. Tough climbs up loose scree slopes are rewarded by magnificent views of ancient volcanoes and thrilling downhill runs to eucalyptus-shaded river valleys and mosque-strewn villages. Bolivia: The Cordillera Real boasts a staggering combination of mountain tundra, plummeting descents, Inca trails and cloud forests. Base yourself in Sorata and explore the maze of tracks that riddle the area, or tackle “The World’s Most Dangerous Road”, which drops from the snow plains of La Paz to the steaming jungle at Coroico in just 64km. Hire a local guide in La Paz and you may also experience the secret grandaddy of all downhills – ten hours of the wildest descent imaginable. But don’t let vertigo bar you from Bolivia – the perfect white flats of the Salar de Uyuni make for an out-of-this-world biking experience if you’re prepared to undertake this four-day challenge. Iceland: Skirting icecaps and volcanoes while cycling across the landscape of Iceland is arguably one of the wildest and most remote two-wheeled experiences in the world. From the lava fields and black sand (ash) deserts, cycle into the Icelandic Highlands and back down into the valleys, stopping to explore waterfalls, mossy craters and glacial rivers. The dramatic terrain makes for a demanding adventure, but the effort is more than worth it when you soothe your aching muscles in natural hot pools under the midnight sun.